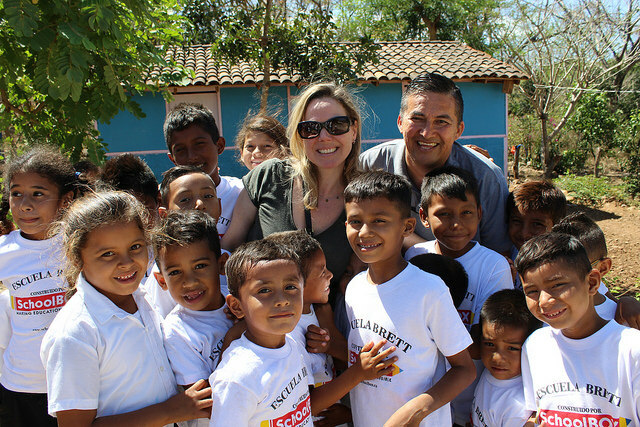 In February of 2018, Brett’s sister Kate travelled to Nicaragua to tour the growing group of schools that our foundation has worked to build in Brett’s name. By this point, we have built so many schools that seeing all of them in just four days is not quite possible. For this trip we chose to see the first, third, sixth and soon to be seventh schools. The following report details her experience. My visit began with the school that not only started the BBC Foundation’s journey building schools but also was the fondation to the SchoolBOX story. Brett’s first school, in the Primavera barrio of Managua will always hold a special place in our hearts. As has happened each time we arrive, the school was prepared with a special welcome. Music played on speakers, girls and boys in costume performed traditional dances, and a student named Genesis delivered a heartfelt recitation of a poem by Ruben Dario (the country’s most famous poet and intellectual). I was handed a microphone and did my best to use my high school Spanish to thank the parents and teachers for everything they do, and to remind the students how important their education is and encourage them to stay in school. This nine-classroom school was completed in 2012, and now has 506 children and 13 teachers. Next we visited Brett’s third school, which has 100 students and 5 teachers. 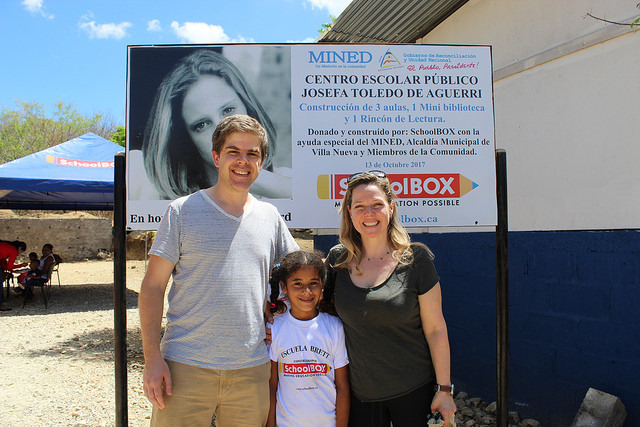 The Mirna Martinez School is named for the woman who originally opened her house for children to go to school in the community of Masaya, just outside Managua. She later donated the land for the school to be built on when her home couldn’t hold the growing numbers of children who craved education. When our family last visited together in 2016, we toured the original school and got to know some of the students, teachers and parents of the community. The former school consisted of the typical dirt floor, corrugated tin roof and walls, with makeshift blackboards or sheets of paper for students to learn from. The community was palpably excited about the potential new building, and upon our return they were emphatic in their gratitude. In addition to the dances and poems, the students presented me with crafts they had worked on and a few individuals made a point of standing up and telling us (the SchoolBOX team) how they were committed and passionate about learning. You could tell they remembered our visit from two years prior, bringing up each of our family member’s names specifically. I made a similar speech at Mirna Martinez, thanking everyone and speaking about what this means to our family. As I toured the school, visiting each brand new classroom, it occurred to me that I would be able to connect with the students even better if I was more fluent in Spanish. I promised everyone that I would take some classes and come back able to make my whole speech in Spanish all by myself, and hopefully they would stay in school in return. At the end of the welcome ceremony, a parent approached us and gave me a beautiful handmade xylophone. It was beyond special for me to come home with the crafts and the xylophone and share them with my three children. I was incredibly proud to explain to them that each thing was handmade by someone who is saying thank you to our family for helping build a school for their community. Following this visit we began a journey deeper into Nicaragua than I had previously travelled. It felt very special to travel with Tom, Ronald and Jazmin, three of the core people who originally formed the heartbeat of SchoolBOX. I felt a little bit like an embedded reporter, picking up bits about the workings of all the classrooms they have built and the lives they continue to impact. We talked a little bit about how if a student makes it through primary school (to the end of the 6th grade) they are very likely to make it all the way to the end of secondary school. The trick is to get students to stay in primary school, as many often leave halfway through. They leave if their parents need them to work, or if the school is perhaps too far away. 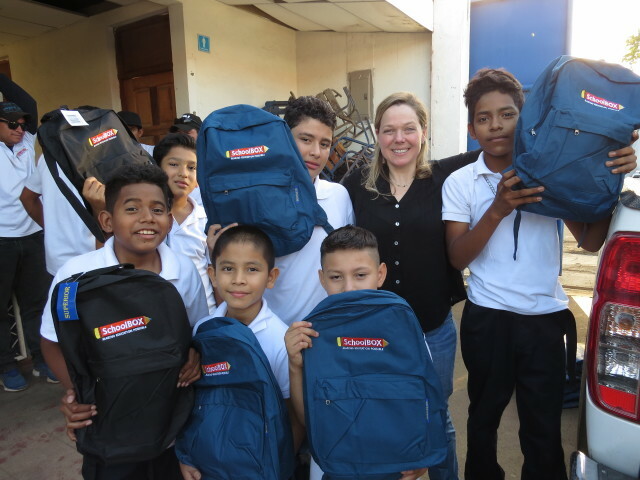 The importance of providing as many Nicaraguan communities as possible with fully functional schools that provide real shelter with washrooms and playing fields alongside the opportunities afforded by a completed primary education cannot be highlighted enough. Next up on our itinerary was the sixth completed school called Josefa Toledo. 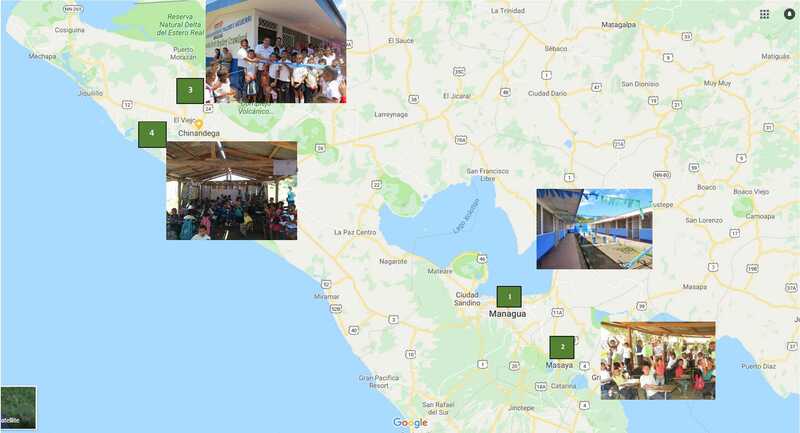 Since this school project had been chosen and built fairly quickly in between our trips to Nicaragua, it was the first time someone from our family was able to visit the community of El Puma and see the new school. We were far north into the country, in the Chinandega region, and could see the mountainous border with Honduras as we approached. It was shared with me that the school’s location is in particular danger of earthquakes and flooding, and so in addition to the new school, a special retaining wall to protect the school had been built and was a successful project. Before the new school was built, the fifth and sixth grade classes didn’t even have a building, and had been learning under the shelter of trees, with no real resources or protection from the elements. Now, 129 students are able to get a proper education at this school. The students were excited about meeting us, and groups of kids followed us around as we toured the three classrooms, posing for photos and peeking in the windows as we walked around. As we walked around, I also found a beautiful plaque that had been made to commemorate Brett, and it felt very special to read it there and know that she is able to continue to make such a difference in so many lives. The children were incredibly enthusiastic about the welcome ceremony and a number of affectionate children found their way onto my lap and giggled hysterically throughout many of the dances. Because Richard had not previously visited this school, I knew that I had to make a particularly special speech in order to make the kind of impression that he has made at each school previous to this. I made sure to explain that my sister Brett was watching over each of them from heaven and that if they keep following the path of education, they have the ability to achieve their greatest dreams. After visiting the sixth school, there was another long drive in store for us, first south and then back north and westward towards the Pacific Ocean. 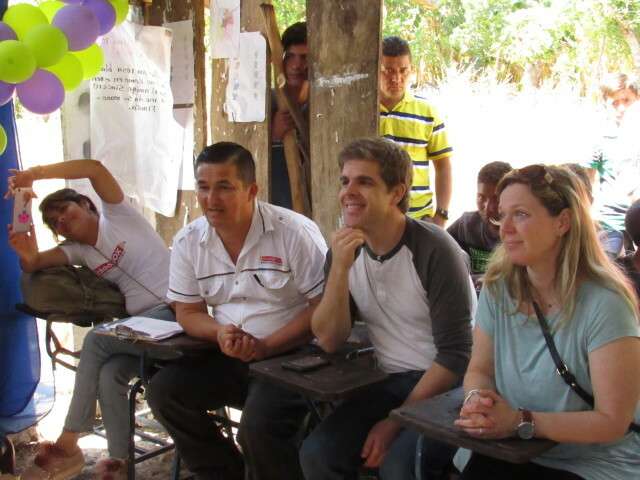 The final school we would visit was in the rural community of Las Noventas. It is next in line for construction, and will be the seventh Brett school. After turning off the main road, we followed a bumpy dirt road for a while before turning onto an even bumpier course through a thickly wooded area of cashew farms. We drove for almost an hour, sharing the road with horses and cows, and finally arrived at the site of the Los Laureles school where kids, teachers and families lined the road, curiously awaiting our arrival. Many of the children looked at us with surprise, as if the dream of finally getting a real school building seemed too good to be true. This community has been waiting a long time for a proper place for their children to receive an education, and having the ministry of education present at the welcome ceremony seemed to really seal the deal for them. The current school is an open-air structure with no walls, and with a metal roof that the parents personally helped to construct when the previous plastic one needed to be replaced. Despite the challenging conditions, 67 children are receiving an education at Los Laureles currently, instructed by 4 dedicated teachers. The parents of this community are truly inspiring, and one mother in particular made a stunning thank you speech expressing her gratitude for our foundation’s pledge to help build three classrooms with washrooms and school essentials such as whiteboards, desks and chairs. Her son should be in fifth grade but was still learning at a much lower level simply due to lack of resources. She explained that even though their community could never hope to compensate us financially, each family would pay us back by ensuring their kids finish primary school in the community and go on to complete their secondary education. I left Nicaragua with a very full heart, feeling inspired and connected. I felt inspired by the drive in the communities to improve their children’s chances to follow their dreams through education. I felt connected to the schools through their constant gratitude and joyous welcome ceremonies. I not only took home crafts and gifts, but also love and the desire to come back as soon as possible…and equipped with a few more Spanish lessons.